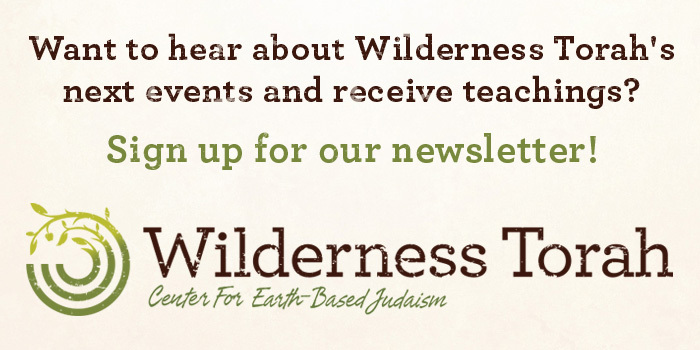 Q: Who is welcome at Wilderness Torah events and festivals? 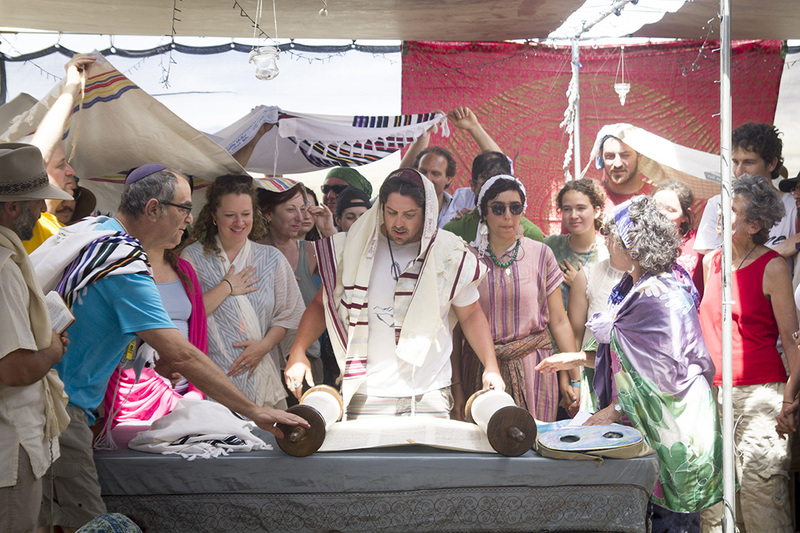 A: Everyone is welcome at Wilderness Torah events and festivals. 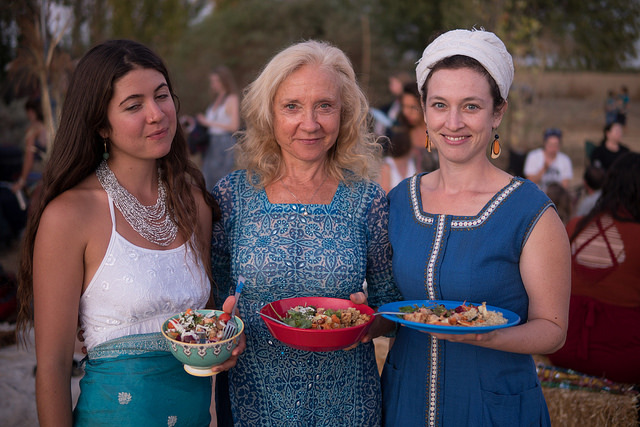 We create pluralistic, multi-generational community celebrations to reconnect us to the earth-based traditions of Judaism. We build villages to include all people. Jews, people with other faiths and backgrounds, interfaith couples and families, those who identify as LGBTQIA, people of color, and anyone who wants to participate are welcome to join in building village together. Please see below for more about religious pluralism at Wilderness Torah. A: Pets are not allowed at festivals due to wilderness and farms rules and the desire to keep the focus on people and ritual space. Q: What is your alcohol and drugs policy? A: Wilderness Torah is a drug- and-alcohol free environment. This is a spiritual community and our festivals are family friendly. 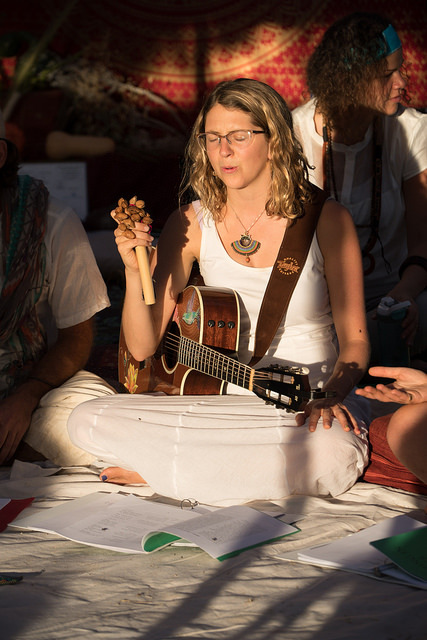 Our primary goals are to build connections among ourselves, community, earth, and Spirit. We will provide a modest amount of wine for ritual purposes. Q: What kinds of facilities are there? A: If you will be camping, you should be comfortable in the outdoors, and previous camping experience is nice, though not required. The temperature in Sonoma County can get pretty hot and windy this time of year, so please pack accordingly. We’ve experienced large rainstorms in the past, as well as bright sunny fall days. If there is substantial rain, we will gather for prayer and ceremony in the spacious Villa. Primitive camping is available for overnight stays in both locations. At the Yom Kippur retreat site, limited non-camping onsite accommodations are available shortly (see Registration for details). Accommodations are limited, so be sure to book immediately if you want to stay with us on the land. Do the lodging accommodations have any amenities? Onsite accommodations include bedding and indoor bathrooms. For those camping, you must provide for all your bedding needs. There will be portable toilets provided in both locations. Due to the limited facilities, showers are not available unless absolutely necessary and by permission only. Q: What kind of camping gear do I need? A: If you decide to camp on the land, you will need your own basic camping gear (tent, sleeping bag, camping mattress). You won’t need anything fancy like featherweight stoves or your own axe. Certain items are a must, like a sun hat and flashlight. Take a look at the What To Bring section for more details. Q: What is your festival cancellation policy? Q: When should I arrive & where do I park? Early arrival is at 3pm. Please do not arrive earlier than 3pm because we will not be ready to greet you. The 3pm arrival enables you to participate in the mikveh (ritual bath), ensures that you have enough time to set up camping or housing, and affords time to arrive and transition from the city. If you come for later arrival, Please arrive no later than 5:30 if at all possible. We truly want to begin the journey as one, all together. Specific information regarding how to get to retreat sites, where to park, and links to carpool signup sheets will be sent to you after you register. Q: How much food should I bring? What kind? Will there be any shared meals? Please bring fish, dairy or vegetarian dishes only. Please be sure to follow this link or the URL below to indicate what you are planning to bring for these vegetarian potlucks. Q: Is there somewhere I can store my food? What about cooking food? We ask everyone to prepare in advance as much as possible and rely on the facilities there as little as possible. There can be access to the kitchen, however it will likely be crowded if everyone relied on use of the kitchen. If possible, please bring food in a cooler. Q: Is there special food for kids? A: Kids Meals will also be potluck. A member from Wilderness Torah’s coordination team will be in touch to help organize snacks and early kids’ dinners. Meals will also be fish, dairy and vegetarian. Q: What is appropriate attire for Wilderness Torah High Holidays? Rosh Hashanah is a new year celebration, so wear your finest to ring in a sweet new year. It is common in our community to wear white to honor the sacred occasion. Yom Kippur is a very solemn day, where we fast and refrain from self-care. Traditionally we do not wear jewelry, leather or anything luxurious. In fact, traditionally we wear our burial shrouds, if we have them, because Yom Kippur is a time of confronting death, mourning, repenting. Traditionally we wear white on Yom Kippur. We also do not wear any leather. For both days, recall that we will be praying in the forest, so come with clothing that can get leaves and soil on it and footwear that is comfortable on soft and uneven ground (no high heels!). Daytime weather can be hot and dry; evening weather can be cold and moist; it could rain. So, bring warm layers and a rain jacket to keep cozy! Q: Why is there a sacred fire and can I help tend it? A key part of Wilderness Torah’s mission is to awaken and celebrate the earth-based traditions of Judaism. A real and direct relationship to fire is one central part of ancient Jewish tradition. Ha’Aish al-ha’mizbeach tukad bo lo tichbeh translates as “the fire on the altar shall be kept burning it shall not be extinguished.” The fire on the altar in the Temple was tended continuously for centuries by the Kohanim (priests) — one of the great, ancient sacred fires of the world that was continuously tended for centuries. Upon that fire the ancestors made offering to a higher power with which they were in a direct relationship. That fire was extinguished nearly 2,000 years ago. Today, we recall that fire with a symbolic LED light, a ner tamid (eternal light) dangling above the ark. There is a yearning, however, to move beyond the symbolic. In particular, within the Wilderness Torah community, awakening a sacred relationship to fire as a context for prayer service has become increasingly desired. Thus, we explore awakening the ancient sacred fire tradition with this sacred fire at Yom Kippur. Fully aware that this contravenes Jewish law today, we approach the creation and tending of this fire in a sacred manner, with the intention that this fire be only as a context and conduit for our prayers to the Holy One. We invite you to explore the power of this ancient, sacred technology at this most powerful time of the Hebrew calendar. Can I sign up to tend the sacred fire? Yes. Please do. You will receive directions on how to do so after you register for the Yom Kippur retreat. Q: What prayer book will we use? We will use excerpts from The Velveteen Rabbi’s Machzor for the Yomim Nora’im to follow the major parts of the Rosh Hashanah and Yom Kippur liturgy. If you prefer to have the complete liturgy, please bring your own Machzor (High Holiday prayer book) if you own one. Q: What Judaism does Wilderness Torah practice? How Jewish is this? A: Wilderness Torah creates a pluralistic community platform where participants of the range of religious observance can participate. We support the observance of Jewish law, such as Shabbat and Kashrut (Jewish dietary laws), and support our diverse community with options for religious observance. For example, during morning Shabbat services, we simultaneously offer a musical service, a traditional egalitarian Minyan, and a group prayer walk. All programming is optional and we hope you’ll experiment, as our prayer options can be very creative and powerful. We aim to support the diversity of individual religious practice. While some will choose to use flashlights and cameras on Shabbat, others will choose to refrain according to their Shabbat practice. We invite you to come with an open mind, a willing heart, and the permission to openly share your needs. We ask all participants to respect differing observance levels and get curious about differences you perceive.Go ahead, ask! Building pluralistic community poses challenges that can become profound learning opportunities. We have also created an additional chag ticket for participants this year so they can come early and fulyl observe the chag. Q: Do you keep kosher? A: Yes. Wilderness Torah maintains a kosher, pesca-vegetarian kitchen. In making its food choices, Wilderness Torah prepares food according to the highest ethical standards, including kosher, local, organic, seasonal, humane, and socially just. Wilderness Torah prioritizes sourcing fresh, unprocessed foods, and when choosing processed or packaged foods, aims to purchase certified kosher foods. Wilderness Torah may at times prioritize certain values, such as local or organic, over kosher-certified. When such a choice is warranted, we will share such decisions openly with signage and provide a kosher option. For example, we purchased local, homemade, organic bagels for Shavuot that were not kosher. We had kosher bread choices available. When we were gifted raw, local, organic honey, we served it alongside kosher honey with clear, both clearly labeled. Please ask if you want more details on how we prepare and maintain kashrut in our wilderness kitchen. Q: How do you observe Shabbat? A: Shabbat (Friday evening to Saturday evening) marks the seventh day of creation when we rest from acts of doing, making, and creating. We strive to make traditional Shabbat observance compatible with the spectrum of needs in the village. For example, we honor Shabbat by not making fire or cooking meals on Shabbat. We also honor the spectrum of Shabbat observance in communal prayer. We celebrate Kabbalat Shabbat prior to candle-lighting with a celebratory, musical service with instruments, and after candle-lighting, we pray the evening service without instruments. During Saturday morning services, we provide a spectrum of prayer options including an instrumental service, a traditional egalitarian service, and a prayer hike. We always honor the end of Shabbat after we find three stars in the sky with a musical Havdalah ceremony to welcome the new week. A: Due to the rustic nature of living outside, we make certain halachic (Jewish legal) exceptions for the health, safety, and comfort of the community. For example, the kitchen prepares hot water during Shabbat for people to have warm drinks if they choose and to ensure that hot dishwater is available to maintain proper sanitation in the kitchen. We also provide hot water that was heated before Shabbat for those who observe. We use a small refrigeration generator to keep food cold and fresh, which we turn off at night when it’s cool to save energy and provide quiet in camp. We restart this generator Shabbat morning as necessary to protect the village’s food. At times, we will choose to use amplification during some communal gatherings on Shabbat so ensure that everyone can hear. We have contemplated building a fire if it becomes very cold in order to protect the comfort and health of participants, based on the principle of pekuach nefesh (exception for saving lives). We often wonder, how did our ancestors celebrate Shabbat when they were nomadic desert people? If this interests you, please come and speak to us about your ideas! Q: Why is there a Fire on Yom Kippur? A: The fire on the altar in the Temple was tended continuously for centuries — one of the great, ancient sacred fires that was continuously tended. Upon that fire the ancestors made offering to Higher Power with which they were in a direct relationship. This was particularly important on Yom Kippur for the special Avodah service. That fire was extinguished nearly 2,000 years ago. Today, we recall that fire by lighting a special fire for Yom Kippur, which makes the Teshuva (spiritual return process) of Yom Kippur particularly potent. Join us as we cleanse, release, and purify for the coming year.